Creation: I-564 was included in Virginia's original interstate plans in 1958. The first piece of I-564 to open was from I-64 to Terminal Blvd (now VA 406), in June 1971 (Kozel). Dotted lines first appeared on the 1972 Official although it implies that it might be open to Terminal Blvd's location (Terminal Blvd was not shown until 1975). Adjustments: The the following completion dates come from Scott Kozel's website. In Nov 1974 (Kozel), I-564 opened another half-mile past Terminal Blvd. In Aug 1977 (Kozel), I-564 was opened to VA 337. Note that I-564 was built directly on top of VA 170 Taussig Blvd except for between US 460 and I-64/VA 165. VA 170 was not officially removed from I-564 until Jan 1979 CTB. In 2012, concrete steps were taken to intiate a project called the I-564 Intermodal Connector. This will entail building a new roadway from a new interchange with I-564 just south of the runway tunnel along the existing railroad due west to VA 337 Hampton Blvd at where the Norfolk International Terminal and Norfolk Naval Base meet. This roadway had been previously been assigned a decade prior as VA 510 but the VDOT link above seems to indicate this will be a part of I-564, though documents relating to the Patriots Crossing ("the thrid crossing") call it the I-564 Connector. Construction is supposed to start in 2015 and be completed in 2017. The Intermodal Connector will line up with the future Patriots Crossing, which has been called I-364 in the VTrans 2025 document. Improvements: I-564 opened as 4-lanes everywhere. 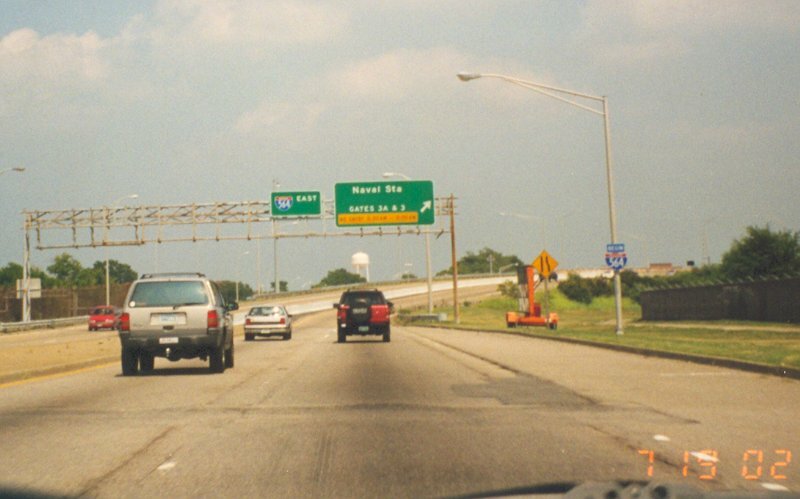 In 1993 (Kozel), I-564 was widened to 6 lanes from I-64 to the Exit for Gate 3. Posted: Fully posted; Don't believe any state-named shields exist. An error VA 564 shield exists at the exit from the Naval Base Exchange at VA 337 for several years now (still in place as of March 2014). Other names: Admiral Taussig Blvd. Comments: I-564 has a short tunnel under the runway at NAS Chambers Field. I-564 was referred to as VA 409 in CTB documents in the late 1950s. I-564 has no exit numbers and its end point at VA 337 is not an interchange - it just stops being a freeway. Until I-781 opened in New York in 2012, this was the only Interstate spur in the country specifically for a military base. Having been stationed in Norfolk (Dec '01 to July '05), I'm very familiar with this road. Originally 4 lanes north of VA 406/Terminal, the road was widened to 6 lanes by using the outside concrete-paved shoulder, and building a new outside shoulder, except within the above-mentioned tunnel, where the original 4-lanes-plus-shoulder was restriped for 6 narrow lanes. What is interesting about this widening job is that the existing lanes are now slightly offset from the original lanes, and with the lanes remaining the original concrete, one can still see both pavement grooves plus indentations where the original lane reflectors sat. It's weird sometimes to be driving over these old lane reflector indentations, even as you're in the middle of your own lane. Mapmikey lived very close to the I-564 interchange with Terminal Blvd when he was 4. This is essentially his first freeway memories.